Purina Veterinary Diet®s “Fighting Pet Obesity” Campaign: Help Shelters and Rescue Groups Pay For Veterinary Procedures With Just a Click! Because Purina is so committed to helping homeless pets, they’ve worked with Adopt-a-Pet.com to set up a special fund to help shelters and rescue groups keep homeless pets healthy while defraying veterinary costs. They’re donating $1.00 for each person who clicks “Like” on their Facebook campaign page, Fighting Pet Obesity, up to $50,000! Please help us reach this goal so we can provide the maximum amount of help to shelters and rescue groups. In these hard economic times, shelters need all the help they can get. Please click “Like” on this page now, and encourage your friends to do the same! The sad truth is an estimated 45% of dogs and 58% of cats in the United States are overweight or obese–that’s an estimated 35 million dogs and 54 million cats. 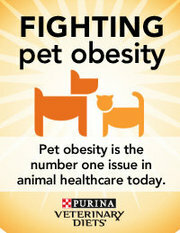 Pet obesity can lead to many other health problems, and Purina Veterinary Diets® wants to help. In addition to the Facebook campaign to raise awareness and funds, they’ve also launched Project: Pet Slim Down ™, a great program with products and tools that may help your pet achieve a healthy weight. We invite you to visit the site and use the Dog and Cat Body Condition System® interactive table to assess if your pet might benefit from a weight management program.